Over the weekend I hung a wreath on the front door, which looks quite rust-coloured in this photo but is more of a warm red. Haven't gotten around to the bow yet, but I clipped a little bird to a branch. 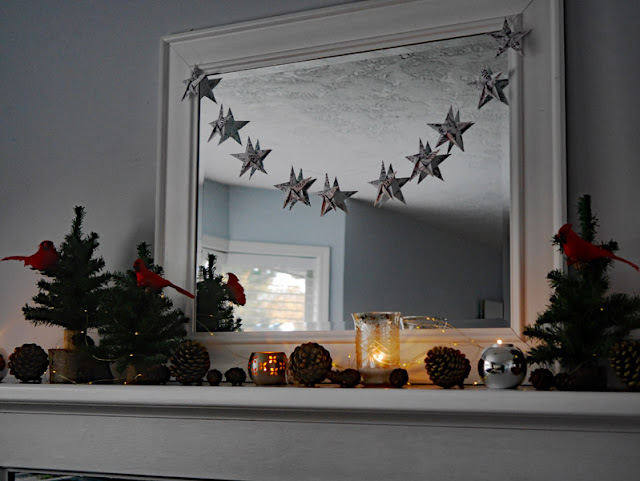 I puttered in the living room, too, hanging a garland of folded paper stars over the mirror, and strewing some simple candles and pinecones along the mantel. To three little artificial trees I clipped more cheery red birds. There have been few opportunities for taking photos. It's dark when I leave for work in the morning and mostly dark when I return. The Grade 8s and 9s are getting squirrellier (spell-check does not like this word) by the minute as the Christmas break approaches. Next week I'll be trying to engage their attention with Christmas vocabulary (French for the 8s and Spanish for the 9s). Let's hope it works. Last night, just before heading off to bed, I took a look outside and saw the most beautiful sight - fat snowflakes falling fast. I was so excited that I lay awake for a long while thinking about snow and hoping it would last. I awoke in the night and got up to look out the window. The snow had stopped falling, but I could see the lawn and streets were covered. However, during the wee hours a bit of rain fell and then froze. What crunchiness ensued! And no snow day. I was so hopeful. Perhaps we'll have more snow. We have had none for several years, so this is quite thrilling - to me. Others are not so thrilled. But surely we can get excited about snow when we know it won't last more than a week, at best. How are your preparations coming? Do you like snow? How charming your picture are, darling Lorrie, thank you for sharing this fascinating, refined Christmas atmosphere with us ! I think squirrelier is a great word, perfect for schoolchildren! No snow here, sadly. Your wreath is so pretty. Your decorations are coming along very nicely. 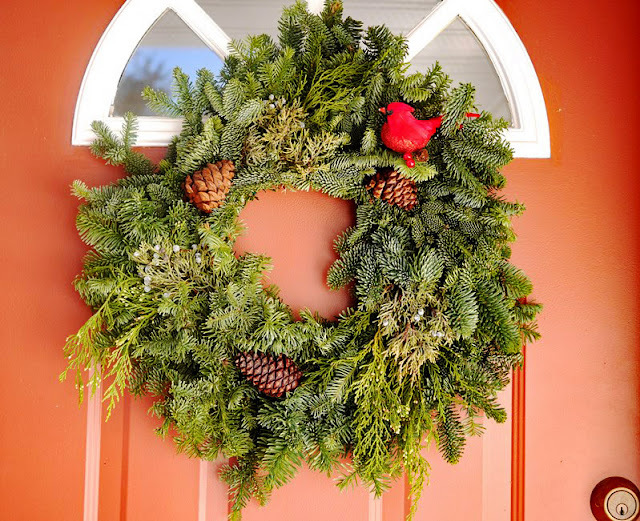 Love the red bird on the wreath! We've had no snow and that's ok.
Of course here in the southern US we long for a good snow storm. We don't get one every year and when it comes, everything pretty much shuts down. And what wonderful days as we stay home, eating soup and hot chocolate, doing things we don't always have time to do while enjoying the beauty outside our windows. I think one of the reasons we love a storm is because it slows us down. And like your snow, it doesn't stay around long. I can totally understand being wakeful in the night, thinking of all the fun you'd have with a day at home! Your decorations are lovely. Your house is looking lovely and festive! Sorry that your snow did not provide you with a snow day. Enjoy it while it lasts! Very pretty decorations, Lorrie...especially those Cardinals!! They are Ohio's state bird & I have several of them on items in my home. I need more! Your photo with the snow on the holly is especially lovely. I love the snow as long as I don't HAVE to drive anywhere in it, until it melts. We're due for some this weekend & I know the kids will be thrilled. Thanks for sharing some of your decorating. I've been using cardinals often this year too. I wish I could see a live one. Blessings on your season of Christ's birth. Not particularly, but it does look "right" at this time of year. Wonderful folded stars garland there adorning your mirror. And your mantle looks very sweet, too. As for squirrelier, I know what you mean...they are all squirreled up! LOL! Here's hoping that you receive the gift of a snow day or two before vacation...I remember how helpful they were. Love the last photo! We are having our first winter blizzard of the year so today will be spent puttering around the house, and for my husband, shovelling the heavy snow. Your star garland is very pretty! We are hoping to get the decorations done this coming weekend, and the colour theme will be red! Well you can't beat it can you! LOL! I like your paper stars hung over the mirror and the cardinals you've included in the decor. I didn't think you'd ever see snow but even with all we get, it's an exciting feeling when the first good snowfall occurs. Lovely festive touches; cute cardinals and cozy candlelight complement your already serene and pretty space. Snow? It depends: if flaky and floating in a flurry of white whimsy, it's very romantic, either day or night. Like you, I also appreciate it more on our Mediterranean island, as it makes a rare appearance every few years or so. Hope you get a snow day, soon! We didn't have enough snow to stick - though it was pretty when falling on Monday but didn't last long. I like snow if it isn't heavy and long lasting - Bellingham has no snow plows - they sold them a few years back because we don't get enough snow and so when we do get a good amount the cars just drive around and make ruts in the snow that freezes, but fortunately it never lasts long. Decorating is all done - and is so cheerful on these dark evenings - even sometimes it is cheerful and bright in the middle of the dark days. Haha, 'squirrellier' sounds like a french term for something you keep a squirrel in!! Yes I love snow too, when I was a little girl I would be watching, nose pressed against the window it minute by minute, as the snow showers fell, and so downhearted if stopped...had time on my side in those days! Awww too bad about no snow day, Lorrie! I did love seeing your photo of the berried shrub covered in the fluffy stuff. We are supposed to get down in the 20's here in Texas tonight! Brrrr! 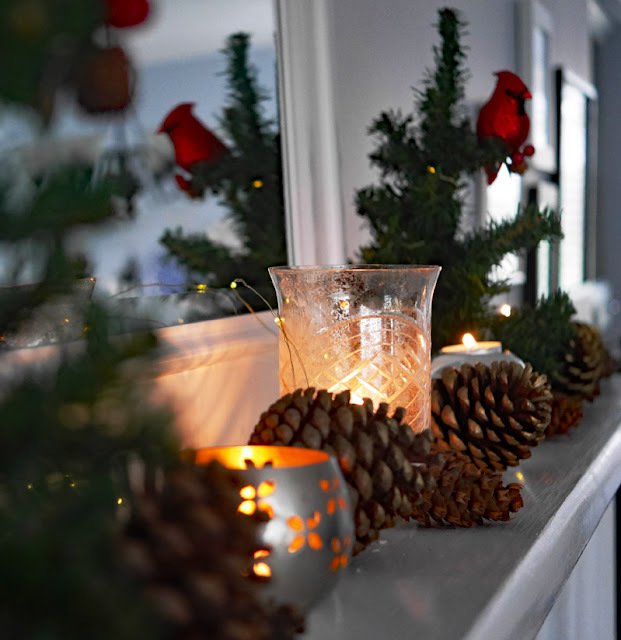 How I loved seeing your pretty mantle with pinecones, berries and trees with pretty birds. Hope those 8th and 9th graders keep their squirliness under control!! I love your pretty wreath and all of the cardinals and pinecones you've used. I have a few in my decorations too! Every time we hike, I want to pick up another 'perfect' pinecone! heehee! Love your home...the snow? Not so much! heehee! Hugs! IT is looking very festive at your house. The snow is beautiful on those berries.